Legendary American death metal band Six Feet Under just released their new covers album, 'Graveyard Classics III,' but they don't have plans to tour in support of it -- other than in Europe. 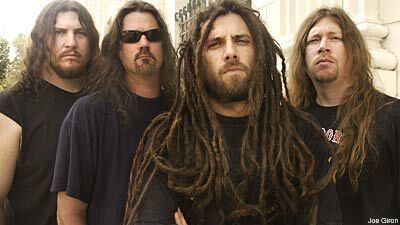 "I don't know how much we'll tour over here," frontman Chris Barnes tells Noisecreep. "I'd love to come to Canada and do some shows up that way. We've got tons of fans and lots people have been waiting to see us up there and in the States, because we haven't [played] here for about three years now. "We don't have a booking agency right now that we're currently working with," he explains. "So it's tough to get things going in that direction, but hopefully we'll get some offers." "We're getting into the rehearsal space now and working some ideas out, just starting to talk about things. So the next three or four months, I think we're at that stage where we're just talking and I'm getting anxious and the rest of the guys are like, 'Yeah, we'll get there,'" Barnes laughs. "So I have to crack the whip. 'Guys, we've got three months. Let's rock. Let's get this together. Let's start writing.' The next [European] tour is coming up in April. I want to get some time in the studio and everything booked. I'm hoping we can get into the studio by the end of summer and get something out early next year." Six Feet Under have been on Metal Blade Records for 15 years, which is unusual in this climate. Their debut album was 1995's 'Haunted.' Barnes, 42, has actually been with the label for 21 years, since he used to be a member of Cannibal Corpse. "It's a good relationship," he says. "They're like brothers and sisters to me. They make me laugh like family, and we argue like family, too, at times. But it's all good times. Half my life has been with Metal Blade Records. It's a scary thing, but it's true."